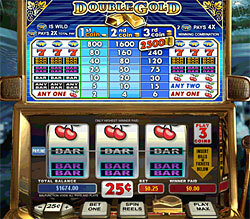 Those of you who have been playing slot machines for a long time will be very familiar with the 3 reel slot games. In the very early days of what we now call slot machines, there were some five-reel games. These proved not so easy to operate so the 3 reel slot machines became the mainstay. If you play any ‘classic slots’ it’ll be pretty certain that they will contain just 3 reels and without any of the bonus games that have come along in recent years as the industry has gone through many a change. By reels of course we mean the vertical sections that spin when you play the game. They often only have 3 rows and of course the big problem here is that the number of paylines in a game are greatly reduced. In fact it was common for there to just be the one payline rather than the many more that we see today in five reel and seven reel games. If you’re new to the world of slot games then it’s a good idea to actually start playing on a 3 reel game. You’ll find it a gentle introduction to slot games rather than trying to immediately get used to working out complicated bonus games. It’s mainly just a question of spinning the reels, crossing your fingers and hoping for the best. The 3 reel game is also a chance for game designers to take a trip back in time and pay homage to the games a lot of people grew up with. That’s why as well as just having 3 reels, they also have old-style symbols such as 7’s, cherries, bells and single, double and triple bars. That’s definitely the case with the Betsoft Games ‘Diamond Jackpot’ and ‘Diamond Dreams‘. Both these games have a classic look to them and look like the actual fruit machines you used to play in the arcades. With there only being 3 reels, there isn’t that much space in the game for too many symbols. This also means that getting a jackpot or another big paying win isn’t too difficult. Hence the fact that the jackpots in the three reel games aren’t usually that high though ‘Diamond Jackpot’ contains a progressive jackpot. However, these 3 reel games are often unpopular with those who simply can’t get enough of all the sophisticated feature that can be found in modern games. The absence of free spins and pick’em games leaves an empty feeling as they seek a game that has lots of betting opportunities. 3 reel games do still have their fans though. That’s probably because as well as being fun to play, they also have that nostalgic feel.